I’m not saying the US isn’t seeing an uptick in buyers from China, especially housing markets such as Manhattan. After all, there is a global trend where money is chasing stability and safety. US real estate has been a key beneficiary of this trend. However it is important to realize that there is no US data from independent sources that links overseas nationalities with residential real estate purchases. Why?…because of long time concerns in the US about fair housing laws and by extension, the gray area of tracking nationalities to housing purchases although it is the norm outside the US. When any housing trend is discussed, it is important to understand where the source of the trend came from. I’d really like housing market followers to appreciate that the trend analysis on the foreign buyer subject bantered in the media as of late is literally based on nothing. There has been an outpouring of coverage of the topic over the past few months, but the sourcing is only from real estate brokerage anecdotes because that is all there is for reporters to work with. I was interviewed for some of the following articles but disagreed with the general story premise, and I assume that is why my view wasn’t inserted. Whichever stance you take on this particular trend – that Russians used to dominate the Manhattan housing market and how the Chinese have taken their place at the top – there really is no wrong answer, because there are no facts. All sourcing on the topic to make that point are from real estate agents referring to their opinion, often based on their past few transactions. I first noticed this new new storyline when Russia invaded Crimea. Would the Russian position as the number 1 foreign buyer of real estate in Manhattan now go away? The brokerage community, or at least a couple of real estate agents claimed this to be the case. I have no evidence to the contrary even though there are huge capital outflows from Russia that began with the Russian invasion of Crimea. In my view, the real estate agents were confused by the high profile sales by Russian buyers (think of Russian Oligarch buying 15 Central Park west for $88M) and perhaps has some direct feedback in some of their own transactions. However I don’t think Russians were ever the top homebuyers in Manhattan, just the highest profile. If we have learned anything from the current Manhattan new development boom, it is the fact that high profile, high end transactions are not a proxy for the balance of the market much like a handful of high profile Russian purchases are not a proxy for some sort of Russian real estate dominance. Now that the Russians are “out” (see previous) of the top spot, that must mean that the Chinese are “in.” Check out the headlines to this storyline although much of these articles build on the Reuters piece (linked below) which is based on real estate agent anecdotes. A slew of brokerage PR driven stories on the Chinese are now dominating the real estate headlines in New York City. Perhaps this uptick as something to do with recent closings at well published Chinese buyer favorites like One57 and perhaps the fact that China is poised to become the world’s number 1 economy. Who are the dominating the foreign buyers of Manhattan real estate? 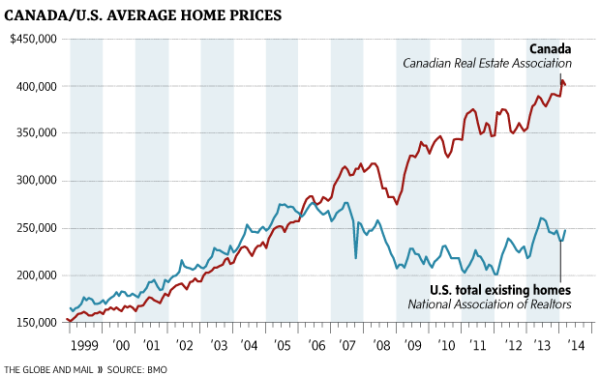 I was reading Tara Perkin’s piece in The Globe and Mail about the record price spread between the US and Canadian housing markets and saw one of the most startling housing charts of late (above). To be clear, this chart doesn’t adjust for the exchange rate but the article says the Canadian/US existing home price spread would be large – closer to 50% than 66% – still huge. Yes, true, but this is probably another good reason not to rely on anything published by a lender’s “chief economist” title due to their inherent bias toward the interests of their employer. What I find fascinating about the Canadian housing market is the proliferation of the false rationale that prices are being used as a measure of housing health. 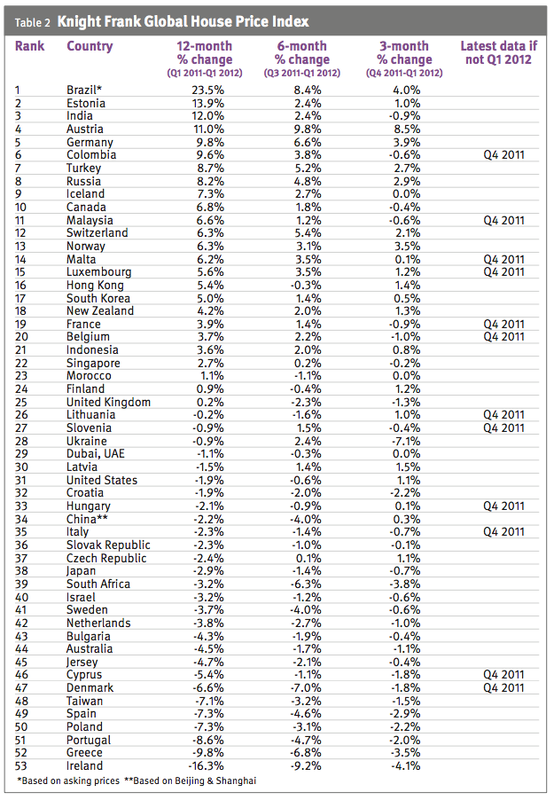 For the US counterpart, think Miami and Las Vegas circa 2005 when prices were skyrocketing and sales were falling. This time last year it was far from clear when and if the Canadian housing market would emerge from the sales slump that ensued after former Finance Minister Jim Flaherty tightened the country’s mortgage insurance rules. 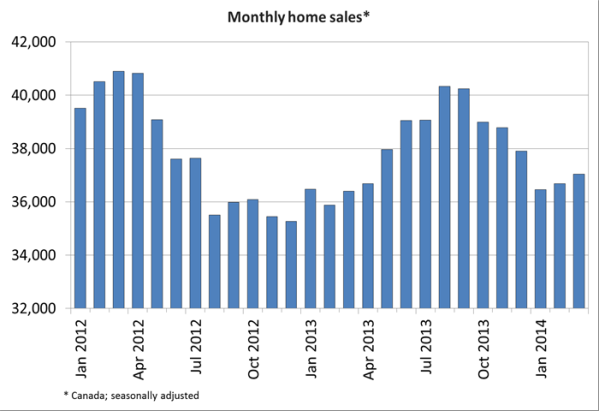 With Canadian home buyer’s access to credit now reigned in, sales fell sharply yet housing prices continued to rise. But Canadian housing prices are rising now much like they are in the US, based on restricted access to credit that keeps inventory off the market. And we’re not talking about household debt. New housing inventory entering the market in Canada is now falling which is continuing to goose (sorry, Canadian geese pun) prices higher. Of course from our past experience in the US, it’s not surprising to see every outpouring of Canadian housing market bubble concern met with an equal outpouring of Canadian housing bubble denial. Please stop using housing prices as a measure of housing health. It was obviously flawed logic when applied in the US during 2003-2006 and now it has become apparent it was flawed during the 2012 to 2013 US run up. 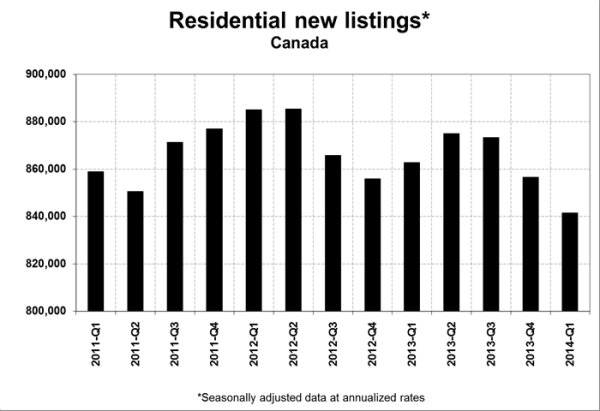 Housing price growth doesn’t reflect good housing market health in Canada either. A friend of mine shared this video with me, a speech by Pierre Poilievre, MP for Nepean-Carleton, on April 4, 2012, spoke on behalf of the Government on Budget 2012. He is incredibly eloquent, insisting that Canada is not going down the path that the US took. Yet here’s a sobering headline. Of course, he’s wrong. Even back well before April of this year you could see the froth in cities like Toronto. In Vancouver, sales have now fallen sharply. Earlier this year I was quoted in the Toronto Star as some sort of bubble veteran that broached the subject of a bubble and I was not surprised to hear the same rationale we heard in the US. Toronto new development was focused on small units to be purchased by investors to rent or flip although defenders rationalized that was how workers would move to the city to expand the economy. Deja vu. Many believe that Canada is different because prices will only fall for the next few years unlike the US where it was a 6 year fall (2006-2012). Well, that is still a correction or bubble for nearly the same reasons as the US: government policy, speculation and cheap credit. I have long thought that all the housing shows on HGTV ie “Property Brothers”, “Holmes on Homes” etc. were filmed in Canada instead of the US because production costs were cheaper – no! My theory: After the US market tanked in 2006, production was much easier in a housing market where prices were rising, marketing times were fast and credit was readily available. That’s why these shows have continued where “flip this house” in California left off….for now. Housing has long been viewed as an emotional investment. Along with the housing boom of the past 5 years, there has a been a boom in reality television shows. My first obsession was This Old House when Bob Vila was host. Housing has morphed into a national obsession. No surprise there. Take a look at this week’s television schedule for HGTV. If we aren’t watching people decorate, we are watching them, sell, buy and flip houses. This AP story I came across in the Washington Post called Real Estate Cold, Real Estate TV Hot seems to defy reality. Ratings are very high. Given the downturn in many real estate markets across the country, I am struck by the dated nature of the reality show title “Flip This House”. Will buys consider a flip with so much excess inventory? What banks are providing investors financing these days…reality shows??? The irony here is that housing reality shows have become housing fantasy shows. With the credit market turmoil, I have begun to wonder whether I am seeing red and gravitating towards all things red. In real estate parlance, this could mean the real estate market is HOT or the real estate market represents DANGER. Red is a color that represents an extreme. The other day, I got the second issue of Portfolio magazine, which is a terrific new Conde Nast publication and has a great interactive web site. The covers alone are worth the purchase price. There have been a few articles that cover real estate topics. The one I really enjoyed was called Little House on the Red Prairie by John Cassidy. The US is the largest debtor in the world with $10.7 trillion on $13.6 trillion economy (hey that’s 79% financing, sort of). Once the Fed started raising rates in June 2004, in the first of 17 consecutive increases, there was an expectation that housing would cool. But some of the highest appreciation rates for appreciation rates occured after this point. Since the middle of 2004, the Fed has taken the federal funds rate—what it charges banks on overnight lending—from 1 percent to 5.25 percent. Nor mally, such a dramatic shift would prompt a sell-off in long-dated Treasury bonds and a rise in long-term interest rates. This time, that didn’t happen. Thanks to all those central banks stocking up on paper issued by Uncle Sam, the interest rate on 10-year and 30-year Treasurys, rather than jumping to 7 percent—which might have been predicted based on past experience—stayed closer to 5 percent. The author suggests that China’s investment in low-yield treasuries helps keep access to US markets and technology. Low mortgage rates fueled the burst in home price appreciation of 2003-2005. In today’s New York Times, there was a very entertaining article about how Kyle MacDonald was able to trade a red paper clip for a house in: Trading Up From Red Paper Clip to White Picket Fence. This lead to a book deal along the way. Of course that’s a simplistic version of the story. Basically he posts an announcement on Craigslist and the trades keep growing in scale. Public relations followed and a town in Canada opted to give him a house. Not a full proof way to get into real estate, but its certainly different and creative. It was a dull day in Montreal, two summers past. The young MacDonald, his fair girlfriend toiling at her labors, was Lying About the House in their minuscule apartment, thinking about What a Drag It Is to Pay Rent and how nice it would be to Own Your Own Place and Stuff Like That when a thought occurred. What if he could trade a red paper clip for a house? Not in one swap but in a bunch of swaps, as in the game Bigger and Better, which he did play when he was but a youth. This story should probably be a staple (sorry) of everyone’s news reading today. This week has been a whirlwind for me personally so my quantity of posts has been less than stellar. I had been retained as a real estate expert for the prosecution (US Government) in media baron Conrad Black‘s federal trial, going on now in Chicago. I testified in Chicago on Tuesday. I had the pleasure of intereacting with really sharp and energetic DOJ attorneys and FBI agents. Obviously, I can provide no specific comments about the case, but it was a terrific experience (not even factoring in the US Department of Justice cafeteria food). I have performed court testimony in many different matters over the years but this trial was one of the highlights of my professional career. My testimony was widely covered in the media (see links below). Normally I wouldn’t even bring this sort of event up, but I was struck by the fact that there has been so little coverage of the trial in New York, that I was surprised by the amount of media presence in the courtroom. Miller’s testimony bolstered the government’s charge that Black, Hollinger International’s former chairman and chief executive, received a sweetheart deal for the apartment, defrauding shareholders of millions of dollars. The apartment sale, prosecutors allege, was part of a scheme involving Black and four former executives to steal $84 million from Hollinger International, now called Sun-Times Media Group Inc. 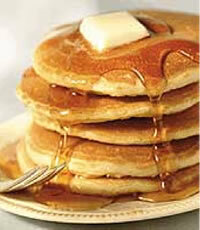 It looks like there has been extra butter and syrup applied to the international housing market this year (ok, this was the last pancake reference, I promise). 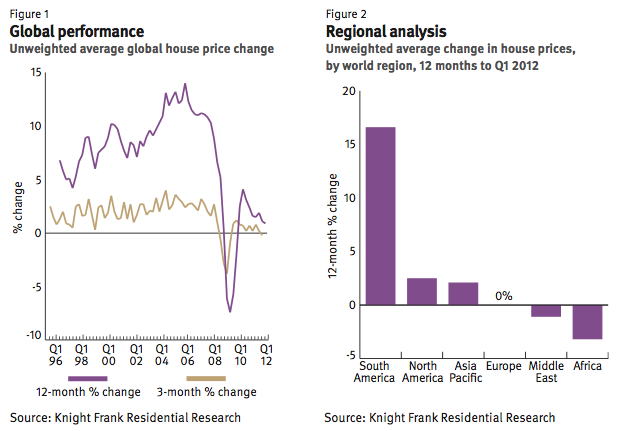 It is amazing how much the housing markets outside the US have seen significant appreciation over the past year. When considering the impetus for the recent US housing boom and the current slow down, this certainly makes for a strong argument that the cause and effect was not just about the US economy since the US has behaved as much as many other countries has. So perhaps we don’t need to be quite so zeroed in on Bernanke and the Fed and perhaps look toward other factors such as the trade deficit and the weakness of the dollar. Have I left any countries out that have seen significant growth? Investor Path: Stock Markets -> Housing -> Commodities -> Gold? With the housing market not seeing the returns of the past few years, investors have been looking at alternatives for a while now. Wall Street is seeing green with the DJIA moving close to a record high. 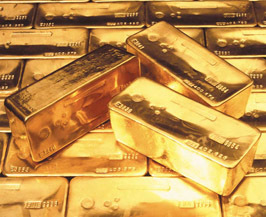 However, some investors are seeing gold in the red-hot commodities market or just plain gold [WaPo], which acts both as a safe-haven asset [theStreet.com] against geopolitical uncertainty and as an inflation hedge against rising energy prices. Upbeat bulls are clearly in the majority on Wall Street right now [WaPo], and truly negative bears are hard to find. But many stock traders and market analysts can identify reasons to be worried about the current state of affairs, and some are actively predicting at least a short downturn by the end of the year. Gold futures, often a haven for “gold bugs” — investors concerned about inflation and geopolitical or stock market turmoil — rose above $700 in New York this week for the first time since 1980. Silver is at a 25-year high, and copper and platinum both set records in the week, though copper pulled back a bit by week’s end. Perhaps we will start seeing Gold Bubble Blogs fairly soon as the price continues to rise rapidly. Comments Off on Investor Path: Stock Markets -> Housing -> Commodities -> Gold? Consumer Reality Distortion, Or Is It? A survey [WSJ] by Royal Bank of Canada’s RBC Capital Markets unit of 1001 consumers found that most owners think their homes will continue to appreciate and the housing boom has not affected their spending patterns. The results of this survey seems to indicate that consumer perceptions of their spending habits contradicts the Fed’s pronouncement that the consumer is driving the economy through extracting equity from their homes. The sample was spread across geography, gender and income brackets, to make it representative of the general U.S. population. The survey’s margin of error was plus or minus 3%. Only 10% of homeowners polled said they believe that rising real-estate values had affected their spending. 60% expect home values to rise at least 5% annualy for the next 3 years. 3% expect home values to fall over the next 3 years. 60% said rising energy costs were causing them to reign in spending. There has been a heated debate between the US and Canada over the tariffs being assigned to softwood imports into the US. In 2002, the US implemented these tariffs, which are reportedly contrary to the NAFTA agreement. [Note: Sub.] A 3-person arbitration board ruled that the US must refund over $5B in tariffs collected from imported Canadian softwood. The US lost the appeal on the ruling but still has refused to refund tariffs already levied. There has been a lot of controversy surrounding the softwood tariff debate. Canada exports more than 50% of the lumber they produce to the US and the US will need more lumber as a result of Hurricane Katrina and the on-going housing boom. Look for rising prices for construction supplies as a result. The housing boom has placed a significant pressure on the availability of lumber for construction. Wood exports from Canada are a significant source of lumber for the US and a major export of Canada. In light of Hurricane Katrina’s extensive damages to the gulf area housing stock of Lousiana, Mississippi and Alabama, demand for construction supplies are expected to increase significantly and at least one advocate for affordable housing wants the tariffs removed. Lets hope these two allies and neighbors can resolve their differences and get this crises resolved soon.